Scribblenauts Unlimited is an action puzzle video game developed by 5th Cell and published by Warner Bros. The game was released as a launch title for the Nintendo Wii U and seems to of gone down very well with gamers – achieving a rating of 9.6/10 from the IGN Community of Gamers, and a rating of 8.8/10 from IGN themselves. Scribblenauts is a cartoon graphics game, with side scroll scenes which look like scenes straight out of a Tom and Jerry cartoon – the possibilities are endless. The game is not only for the Wii U though, it's also been released on the PC and on the Nintendo 3Ds (which is where we saw the previous Scribblenauts title's being released). Until now, Scribblenauts has always been a handheld type game – played on a portable device like the Nintendo 3Ds, but now it's wrapped in the full glory of high definition and on the big screen… it's just got a whole load better. This is the fourth title in the Scribblenauts series, the game seems to be growing more and more popular with each title that's released. 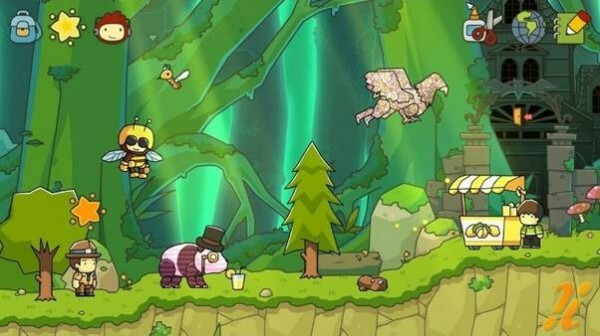 Scribblenauts features a side-scrolling open world with all new, HD, hand-drawn scenery and objects which can be used by the player of the game to help the game's hero, Maxwell, solve the puzzles and challenges the game presents. Scribblenauts Unlimited also introduces us to Maxwell's parents and family life for the first time, giving us an insight into his family, and how he acquired his magical notepad. 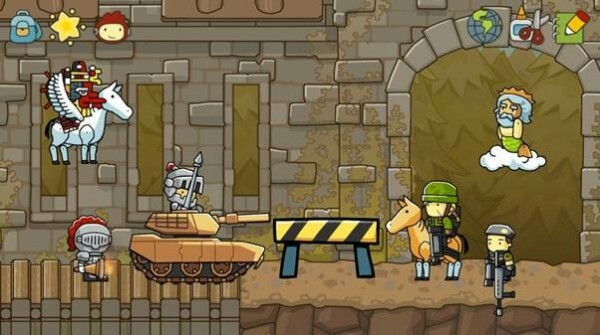 The fundamentals of the gameplay in Scribblenauts Unlimited is similar to that of previous titles in the series. Maxwell returns once again as the player character, and the objective remains the same; collect Starites by using the player created objects in the game to complete various tasks. One of the main differences with this version of the game is that the world you're playing in is now in high definition. It can be played on your big-screen TV, rather than on the small screen like with the Nintendo 3Ds versions of the game, and you're playing in a completely open-to-explore world. As the player, you can traverse around different themed areas and accept various challenges from NPCs. You'll find that sometimes an NPC will transport you to a separate, self-contained level, like back in the earlier Scribblenauts titles. The upgrades in this game and to the Objectnaut engine provide you with some new options whilst creating objects. This game also seems to be more adventure based than the previous titles, which were more simply about completing the puzzles. The sense of adventure in this game is a big part of it. To conclude, Scribblenauts Unlimited is still every bit the game you know and love from the previous versions of the game released in 2009, but the level of polish and refinement is amazing! The game finally delivers across the board. Despite some problems with the overall difficulty of the puzzles, the game has an overwhelming amount of content for the gamer to discover, and create from scratch. Whether you have played any of the Scribblenauts games before, or this is your first time, you should still start with this game. There's so much to do and show off that you'll never get bored. And if you're particularly creative, then you'll love the Object Editor. Scribblenauts Unlimited is one of the best Wii U launch titles, gaining high ratings across most of the gaming industry. This is definitely a game to look out for and without a doubt, it's the best Scribblenauts title yet! Author Bio: The author of this article runs a website where you can play free Tom and Jerry games, check it out now.